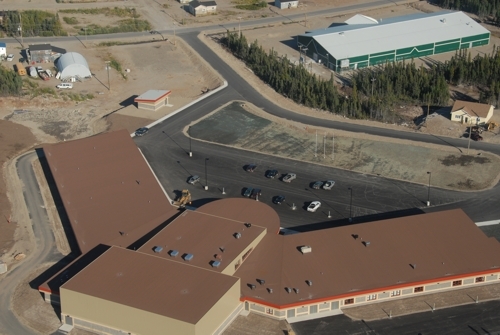 In addition to increased classroom space, the new school has a larger gym, industrial arts facilities, a laboratory, a cafeteria and appropriate spaces for special needs students. Community leaders have been involved from the start on this project, we provided an Innu Advisor to the architect in charge of the design proudly explains Anastasia Qupee, Chief of Sheshatshiu Innu First Nation that piloted the project. Michel Andrew, 27, ended his walk from Sheshatshiu to Natuashish at around noon after hiking across the Labrador wilderness. 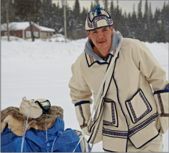 He was joined by two women from Natuashish for part of his journey, and a group of children from the community walked the last few kilometers with him. The community honoured Andrew by closing businesses for the day and planning a full day of events. Read the cbc coverage here .